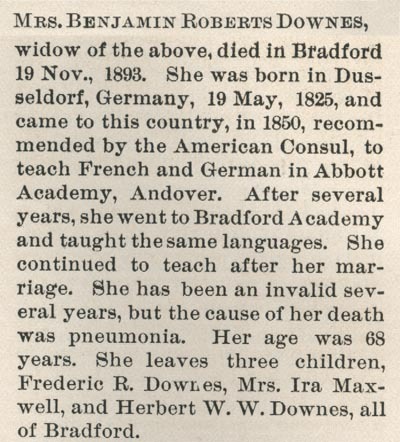 Mrs. Benjamin Roberts Downes, widow of the above, died in Bradford 19 Nov., 1893. She was born in Dusseldorf, Germany, 19 May, 1825, and came to this country, in 1860, recommended by the American Consul, to teach French and German in Abbott Academy, Andover. After several years, she went to Bradford Academy and taught the same languages. She continued to teach after her marriage. She has been an invalid several years, but the cause of her death was pneumonia. Her age was 68 years. She leaves three children, Frederic R. Downes, Mrs. Ira Maxwell, and Herbert W. W. Downes, all of Bradford. 1. Essex-County Historical & Genealogical Register, Vol. 1, No. 3, March, 1894, page 46. Are you looking for DOWNES ancestors? If so, we suggest posting a query to our Community Message Board to get assistance from other researchers.